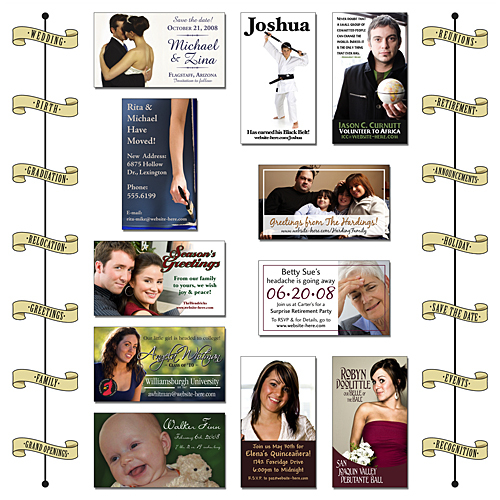 Need a fun and creative way to tell your friends and family about your special upcoming event1/3 Business Card Magnets are a special reminder that will allow your guests enough time to "Save the Date" for your memorable and special day. Personalize the magnet with your photo and information and give your guests a unique gift to assure their presence. Full-Color business card magnets (3.5 x 2) hang around in high-traffic areas and give a daily reminder. Full-Color Magnets stick to refrigerators, filing cabinets, appliances, vending machines, lockers and any other metal surface and will hold paper, pictures and more. Perfect for any type of announcement including weddings, births, retirements, reunions, greetings, moving / relocations, grand openings, special events, volunteer work, season’s greetings, sport recognition, party announcements, save the date, etc.